COPPER MOUNTAIN, Colo. – Dec. 21, 2017 – There’s no place like home for the holidays and families from near and far are invited to make Copper Mountain their home this season with an abundance of events and activities for all ages and interests. It all kicks off on Sunday, Dec. 24 at 5 p.m. when children are encouraged to meet near Mountain Melt to participate in a glowstick pageant stroll through Center Village. At 6:15 p.m., a torchlight parade down Main Vein welcomes Santa as he makes his way down to meet with children and watch the fireworks before he departs for a busy night of delivering presents. The fun continues into the following weekend with an Art Auction and Wine & Chocolate Tasting on Dec. 29 as part of Boarding for Breast Cancer's Shred the Love at Copper Mountain. From 6-8 p.m. in the Woodward Copper Barn, Boarding for Breast Cancer will be raising money in support of their mission to advocate for early detection and a healthy, active, and sustainable lifestyle as the best means for cancer prevention. For a $10 donation, attendees will receive a pairing of four wines and four Chocolove chocolates in addition to access of the Art Auction making it a perfect girls' night out. Then, wake up with B4BC on Dec. 30 for 8 a.m. yoga at the Barn for a suggested donation of $20. To round out the Shred to Love event at Copper, B4BC will also be hosting a park jam from 11 a.m. to noon. For all of the details on Boarding for Breast Cancer's Shred the Love event, visit www.b4bc.org/shredthelove. Also on Dec. 30, a new experience debuts out of the REI Adventure Station called Snowshoe and Hot Chocolate Extravaganza. On this two hour snowshoe journey guests will take in the snowy sights of winter with a cup of gourmet hot chocolate in hand as REI guides lead the way. The REI Snowshoe and Hot Chocolate Extravaganza departs daily at 10 a.m. beginning Saturday, Dec. 30 and is suitable for beginner snowshoe enthusiasts ages 13 and up. For more information and to register, visit www.rei.com/copper-mountain. Adventurers seeking a moonlight mountain experience are invited to attend the New Year’s Eve Dine & Ski on Sunday, Dec. 31. Ride the American Eagle Lift after hours for a mid-mountain fine dining experience at Solitude Station complete with live music, party favors and a champagne toast. Guests will be able to ski or snowboard down to Center Village under the full moon or take a snowcat for an additional fee. 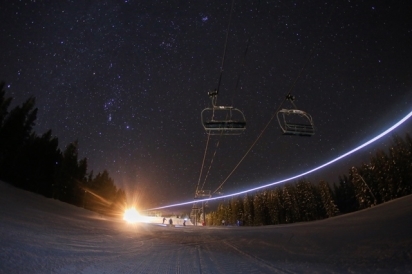 Space for the New Year’s Eve Dine & Ski is limited and guests are encouraged to visit www.coppercolorado.com to pre-register. Throughout the day on Dec. 31, Copper Mountain will be abuzz with activity including a USASA Rail Jam on Lower Bouncer and music from DJ Landry. As the sun sets, a torchlight parade will kick off at 6 p.m. followed by fireworks later in the evening at 10 p.m.
There’s still time to book a home away from home for the holidays with Last Chance Lodging packages offering savings of up to 40 percent. To learn more, visit www.coppercolorado.com.